Developing applications for Android involves a considerable amount of programming work which, by definition, involves typing, reviewing and modifying lines of code. It should come as no surprise that the majority of a developer’s time spent using Android Studio will typically involve editing code within the editor window. The modern code editor needs to go far beyond the original basics of typing, deleting, cutting and pasting. Today the usefulness of a code editor is generally gauged by factors such as the amount by which it reduces the typing required by the programmer, ease of navigation through large source code files and the editor’s ability to detect and highlight programming errors in real-time as the code is being written. As will become evident in this chapter, these are just a few of the areas in which the Android Studio editor excels. While not an exhaustive overview of the features of the Android Studio editor, this chapter aims to provide a guide to the key features of the tool. Experienced programmers will find that some of these features are common to most code editors available today, while a number are unique to this particular editing environment. A – Document Tabs﻿ – Android Studio is capable of holding multiple files open for editing at any one time. As each file is opened, it is assigned a document tab displaying the file name in the tab bar located along the top edge of the editor window. A small dropdown menu will appear in the far right-hand corner of the tab bar when there is insufficient room to display all of the tabs. Clicking on this menu will drop down a list of additional open files. A wavy red line underneath a file name in a tab indicates that the code in the file contains one or more errors that need to be addressed before the project can be compiled and run. Switching between files﻿ is simply a matter of clicking on the corresponding tab or using the Alt-Left and Alt-Right keyboard shortcuts. Navigation between files may also be performed using the Switcher mechanism (accessible via the Ctrl-Tab keyboard shortcut). To detach an editor panel from the Android Studio main window so that it appears in a separate window, click on the tab and drag it to an area on the desktop outside of the main window. To return the editor to the main window, click on the file tab in the separated editor window and drag and drop it onto the original editor tab bar in the main window. B – The Editor Gutter Area﻿ - The gutter area is used by the editor to display informational icons and controls. Some typical items, among others, which appear in this gutter area are debugging breakpoint markers, controls to fold and unfold blocks of code, bookmarks, change markers and line numbers. Line numbers are switched on by default but may be disabled by right-clicking in the gutter and selecting the Show Line Numbers menu option. C – The Status Bar﻿ – Though the status bar is actually part of the main window, as opposed to the editor, it does contain some information about the currently active editing session. This information includes the current position of the cursor in terms of lines and characters and the encoding format of the file (UTF-8, ASCII etc.). Clicking on these values in the status bar allows the corresponding setting to be changed. Clicking on the line number, for example, displays the Go to Line dialog. D – The Editor Area﻿ – This is the main area where the code is displayed, entered and edited by the user. Later sections of this chapter will cover the key features of the editing area in detail. It is also worth noting that the lens overlay is not limited to warnings and errors in the sidebar. Hovering over any part of the sidebar will result in a lens appearing containing the code present at that location within the source file. Having provided an overview of the elements that comprise the Android Studio editor, the remainder of this chapter will explore the key features of the editing environment in more detail. The orientation of a split panel may be changed at any time by right-clicking on the corresponding tab and selecting the Change Splitter Orientation menu option. Repeat these steps to unsplit a single panel, this time selecting the Unsplit option from the menu. All of the split panels may be removed by right-clicking on any tab and selecting the Unsplit All menu option. Window splitting may be used to display different files, or to provide multiple windows onto the same file, allowing different areas of the same file to be viewed and edited concurrently. If none of the auto completion suggestions are correct, simply keep typing and the editor will continue to refine the suggestions where appropriate. To accept the top most suggestion, simply press the Enter or Tab key on the keyboard. To select a different suggestion, use the arrow keys to move up and down the list, once again using the Enter or Tab key to select the highlighted item. Completion suggestions can be manually invoked using the Ctrl-Space keyboard sequence. This can be useful when changing a word or declaration in the editor. When the cursor is positioned over a word in the editor, that word will automatically highlight. Pressing Ctrl-Space will display a list of alternate suggestions. To replace the current word with the currently highlighted item in the suggestion list, simply press the Tab key. 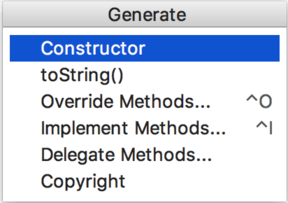 In addition to the real-time auto completion feature, the Android Studio editor also offers a system referred to as Smart Completion. Smart completion is invoked using the Shift-Ctrl-Space keyboard sequence and, when selected, will provide more detailed suggestions based on the current context of the code. Pressing the Shift-Ctrl-Space shortcut sequence a second time will provide more suggestions from a wider range of possibilities. The settings for this mode may be configured by selecting the File -> Settings (Android Studio -> Preferences on macOS) menu option followed by Editor -> Appearance in the left-hand panel. On the Appearance screen, enable or disable the Show parameter name hints option. To adjust the hint settings, click on the Configure... button, select the programming language and make any necessary adjustments. All of the code blocks in a file may be folded or unfolded using the Ctrl-Shift-Plus and Ctrl-Shift-Minus keyboard sequences. Context sensitive Java﻿ and Android documentation can be accessed by placing the cursor over the declaration for which documentation is required and pressing the Ctrl-Q keyboard shortcut (Ctrl-J on macOS). This will display a popup containing the relevant reference documentation for the item. 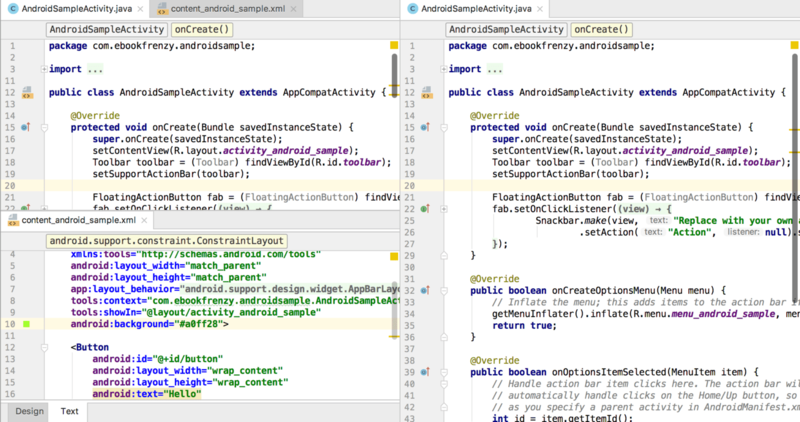 Figure 8-16, for example, shows the documentation for the Android Snackbar class. Once displayed, the documentation popup can be moved around the screen as needed. Clicking on the push pin icon located in the right-hand corner of the popup title bar will ensure that the popup remains visible once focus moves back to the editor, leaving the documentation visible as a reference while typing code. 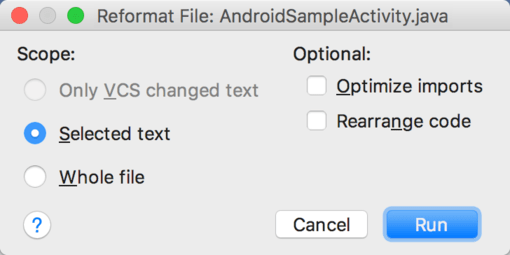 ﻿In general, the Android Studio editor will automatically format code in terms of indenting, spacing and nesting of statements and code blocks as they are added. In situations where lines of code need to be reformatted (a common occurrence, for example, when cutting and pasting sample code from a web site), the editor provides a source code reformatting feature which, when selected, will automatically reformat code to match the prevailing code style. To reformat source code, press the Ctrl-Alt-L (Cmd-Alt-L on macOS) keyboard shortcut sequence. To display the Reformat Code dialog (Figure 8-17) use the Ctrl-Alt-Shift-L (Cmd-Alt-Shift-L on macOS). This dialog provides the option to reformat only the currently selected code, the entire source file currently active in the editor or only code that has changed as the result of a source code control update. 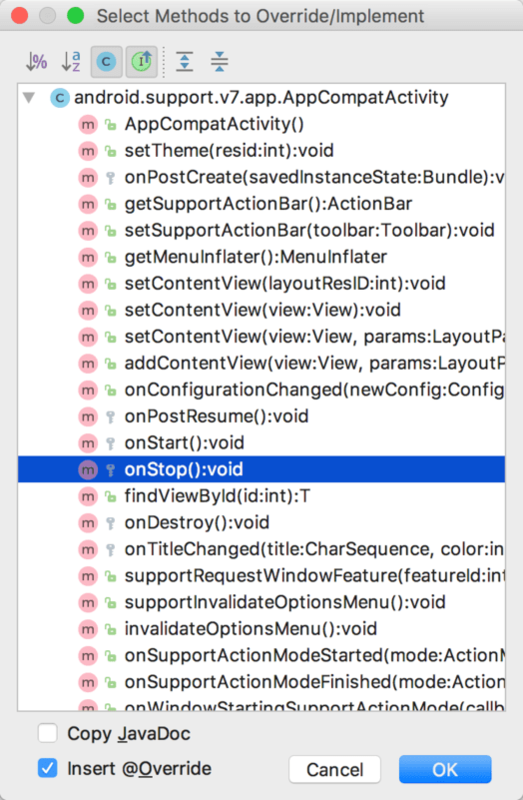 The full range of code style preferences can be changed from within the project settings dialog. 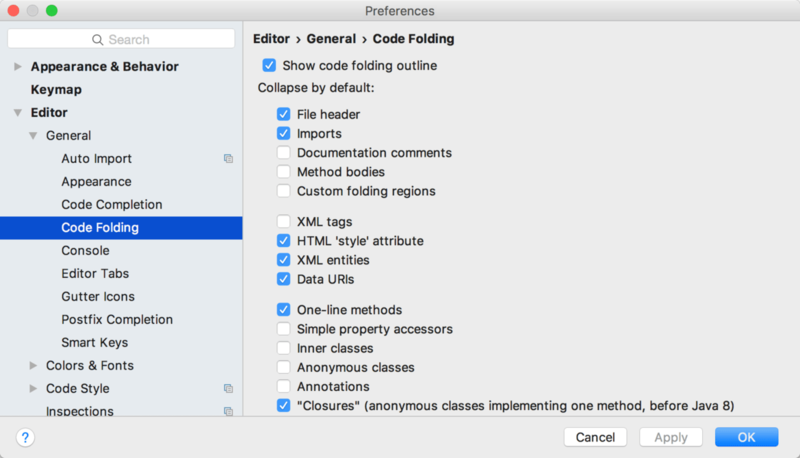 Select the File -> Settings menu option (Android Studio -> Preferences… on macOS) and choose Code Style in the left-hand panel to access a list of supported programming and markup languages. 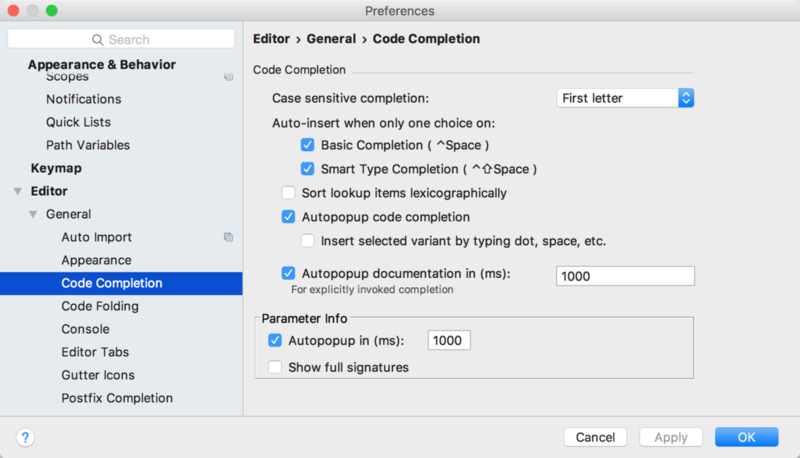 Selecting a language will provide access to a vast array of formatting style options, all of which may be modified from the Android Studio default to match your preferred code style. To configure the settings for the Rearrange code option in the above dialog, for example, unfold the Code Style section, select Java﻿ and, from the Java﻿ settings, select the Arrangement tab. 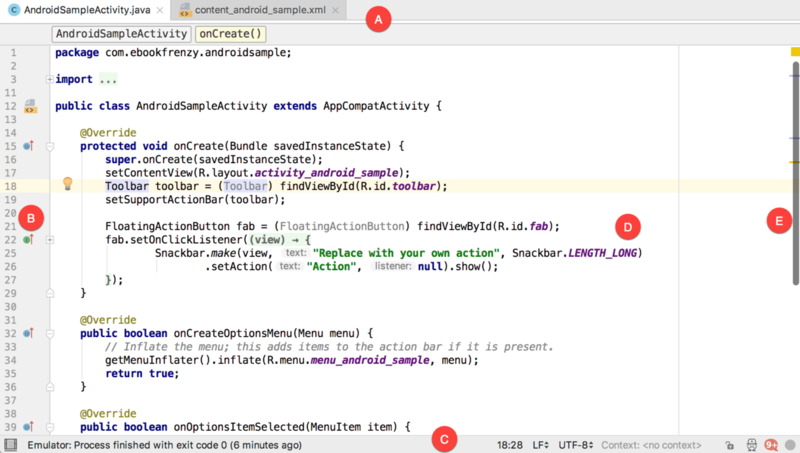 The Android Studio editor goes to great length to reduce the amount of typing needed to write code and to make that code easier to read and navigate. In this chapter we have covered a number of the key editor features including code completion, code generation, editor window splitting, code folding, reformatting and documentation lookup. This page was last modified on 9 January 2019, at 20:06.